It is well established that in northern Canada food insecurity is a serious problem that affects the health and wellness of Northerners, with implications for Canada more broadly. While food insecurity is not a new problem, the ways in which it is experienced in northern Canada are highly contemporary. Processes of colonialism and environmental dispossession, rapid and sometimes unpredictable environmental change, economic transitions and material poverty, changing demographics, and current logistical challenges are some of the factors that shape this modern version of food insecurity. In 2014 the CCA published Aboriginal Food Security in Northern Canada. The report addresses the diversity of experience that northern First Nations, Inuit, and Métis households and communities have with food insecurity. It provides data on the various rates of food insecurity, explores how different factors affect food security, and describes the health and social effects of rapid social, environmental, and economic transitions. Beyond the price of groceries, food security is a complex issue of human health and well-being that requires multiple solutions. To understand food security in northern Aboriginal environments, the Panel took a holistic approach. 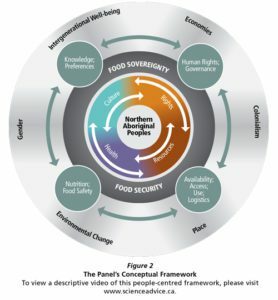 This people-centred framework presents the many factors that influence life in the North. For example, environmental change poses a specific threat to traditional/country food sources in the North because it affects wildlife abundance and availability, the extent to which humans can safely access wild food, and the safety and quality of the food. Environmental change also affects the logistics of store-bought food. While shipping food may become easier in some cases, less predictable freezing and thawing of the sea ice can affect access to ports, and melting permafrost can interfere with airport infrastructure and the safety of ice roads. The Panel concluded that lasting solutions require collaboration and the continued involvement of those most affected by food insecurity: people living in the North. Although published in 2014, the report continues to offer policy-makers a holistic starting-point for discussion and problem-solving. It also provides evidence and options to researchers and communities engaging in local responses. Nous évaluons les meilleures données disponibles sur des enjeux particulièrement complexes, dont les aspects scientifiques peuvent être difficiles à réunir ou à comprendre, ou contradictoires.